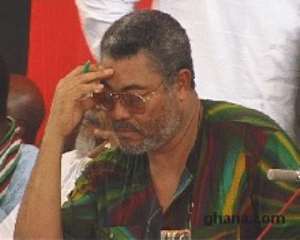 The Criminal Investigations Department (CID) of the police service has sent a second invitation to former President Rawlings to assist it in its investigations into his alleged assault of a man at Ashaiman. This followed a complaint of assault lodged with the CID by Mr. Adamu Seini Masu against the former President and one of his guards. The Director of CID, Mr. David Asante-Apeatu, who disclosed this yesterday March 31 said the former president had earlier declined an invitation extended to him by the police to assist in the assault case. He said in first instance, the letter was sent by the CID to him to appear at 2pim on Tuesday and it was duly received and signed by Mr. Victor Smith, the former Presidents Special Assistant. Mr. Asante-Apeatu said although Mr. Smith on receipt of the letter tore it open and said he was going to give it to the former president, neither of them showed up. He said no reason had also been assigned by the former president for his failure to appear so the CID was compelled to send him another letter. The director said the incident occurred at Ashaiman on Thursday March 25, 2004, when the former president went to inspect some polling stations. He said the complainant claimed the former president pulled him and he was further assaulted by his guards. Mr. Asante-Apeatu said the CID received a complaint and initiated an investigation into it. When asked about the next line of action should the former president decline the second invitation, the CID boss said he would have to consult the attorney-general on the next of action.